Congratulations to "Laura H.", the winner in Roni's giveaway. Thank you to all who participated! It seemed even after all the years had passed, Finn still had the ability to get her mind off things. When her mom was going through chemo and everything was doom and gloom at home, Finn could somehow figure out ways not just to make her laugh, but to do so in a way that didn’t make her feel guilty for feeling a moment of happiness. “I…” Whatever she was going to say died on her lips because the way he was looking at her made her forget her words. There was want there in those green depths—lust—but there was something else. Something that made her breath stall. Need mixed with something more dangerous. A wildness. A curl of heat went up her spine, twining with unease. So much of her wanted to give into it, to see what exactly was simmering there between them. Just grab him and say to hell with it all and make the sheets even sweatier than they already were. But as much as he was drawing her in with that look, he was also warning her off. She didn’t know how she got that sense, but it was there, loud and clear. Push me away. Run. He wanted her to stop this. He’d told her outside what he had to offer—nothing but a one night stand. And though right now that sounded all kinds of enticing, she wasn’t going to go there. He didn’t want this. Plus, even sober, it would be too close to how she’d handled her anxiety in college. She didn’t need to chase away her nightmare with a hook-up she’d regret in the morning. She wasn’t that girl anymore. He released her and she climbed off the bed with shaky limbs. She wouldn’t let herself look at him. She needed a task—something, anything, to get her mind off the man sitting on her bed. She packed up in record time, and Finn retrieved his gun from the drawer, tucking it in the pocket of the robe. No words were exchanged. When she was done gathering her things, he helped her roll her bag down the hallway to his room. He let her inside and quickly rounded up his own stuff. He moved with quiet efficiency, awkwardness creeping into the silence between them and spreading into every corner of the room. He looked up, his hands full of computer wires. He tucked the computer cords in his bag and straightened, his watchful gaze making her fidgety. She was confused for a second, her brain running on too much adrenaline and too little sleep, but eventually his request registered. She reached into her bag to pull out her cell. He stepped out into the hallway without a backward glance and headed to the room they’d left, obviously more than a little eager to get the hell away from her. She didn’t blame him. She’d apparently become the queen of awkward conversation tonight. With a sigh, she locked her door and made her way over to the bed and collapsed onto it. Spent. Exhausted. And a little frustrated. Finn had taken her words like she wanted someone to call when she needed help, but she wasn’t in the market for a therapist or a savior. She was in the market for a friend. But maybe she was grasping for something that didn’t exist with Finn anymore. Maybe she was just being nostalgic. They weren’t in high school. They didn’t live in the same place. They couldn’t just hang out. The time for that had past. She needed to be okay with that. If he wasn’t interested in keeping in touch, she wasn’t going to chase him. She checked the time on her phone to see how many hours she needed to kill before breakfast. But instead of seeing the time, she saw the address book entry Finn had made. And a note beneath: You will never be a stranger to me. 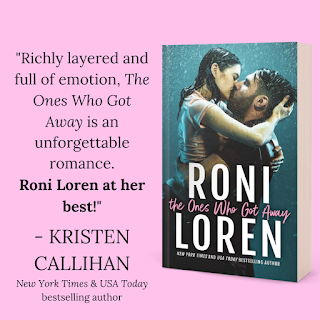 Roni will be giving away a signed copy of THE ONES WHO GOT AWAY to one lucky person leaving a comment or email entry. Giveaway ends 11:59pm EST Nov. 11th. Please supply your email in the post. You may use spaces or full text for security. (ex. jsmith at gmail dot com) If you do not wish to supply your email, or have trouble posting, please email maureen@JustContemporaryRomance.com with a subject title of JCR GIVEAWAY to be entered in the current giveaway. US residents ONLY. Enjoyed the excerpt - eager to discover more about the survivors. Sounds like an interesting premise. 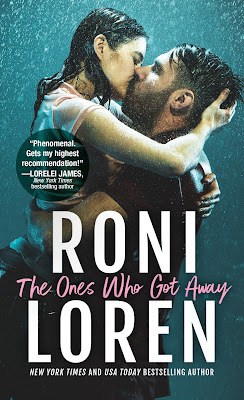 I'm such a big fan of Roni Loren! I adore her Loving on the Edge and The Pleasure Principle series.